King Abdullah II and Egyptian President Abdel Fattah Al-Sisi affirm importance of efforts to achieve peace based on two-state solution. King Abdullah II of Jordan and Egyptian President Abdel Fattah Al-Sisi met in Amman on Sunday and called for a two-state solution for the Israeli-Palestinian Arab conflict. The two leaders affirmed the importance of intensifying international efforts to end the Palestinian-Israeli conflict and to reach a just and lasting peace based on the two-state solution and the Arab Peace Initiative, the report said. The two sides also called for an end to “Israeli escalations” in Jerusalem and violations at the Al-Aqsa Mosque. Jordan and Egypt are the only two Arab countries to have signed peace treaties with Israel, though Israel’s relations with both countries have been cold at times. 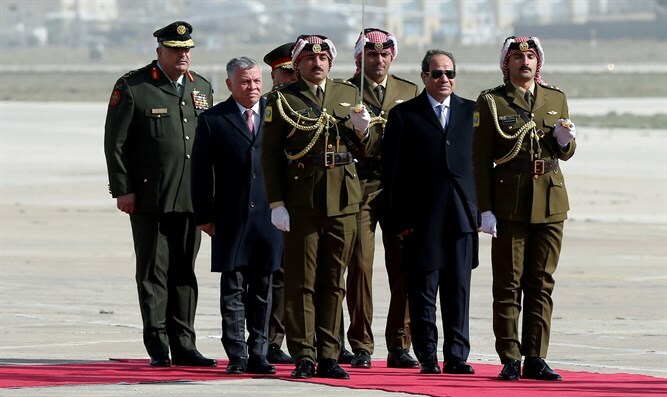 Two weeks ago Jordan reaffirmed its commitment to the peace treaty with Israel, in the wake of the incident in which a Jordanian minister was pictured stepping on an image of the Israeli flag while entering a meeting. Meanwhile, Sisi last week offered a rare acknowledgement of his country’s close security cooperation with Israel in the Sinai Peninsula. Asked whether the cooperation with Israel was the closest and deepest that he has had with Israel, Sisi replied, "That is correct." "The Air Force sometimes needs to cross to the Israeli side. And that's why we have a wide range of coordination with the Israelis," the Egyptian President replied. The meeting between King Abdullah and Sisi also comes as efforts continue to restart the stalled peace talks between Israel and the Palestinian Authority (PA). The Trump administration has been working on a plan for peace between Israel and the PA, but PA chairman Mahmoud Abbas has rejected that peace plan before it has even been unveiled. Abbas has been boycotting the US ever since President Donald Trump’s recognition of Jerusalem as Israel’s capital in December of 2017. Sisi has in the past urged Israelis and Palestinian Arabs to seize what he said was a "real opportunity" for peace and hailed his own country's peace deal with Israel. He repeated his call for a resumption of peace talks between Israel and the PA in September of 2018.